Overseas? Don’t leave your Kruger garden unattended! Neither was the trip back! After a monster 24-hour journey, we made it home in one piece late on Sunday afternoon. Steven and I looked at each other when we drove over the bridge. Home! 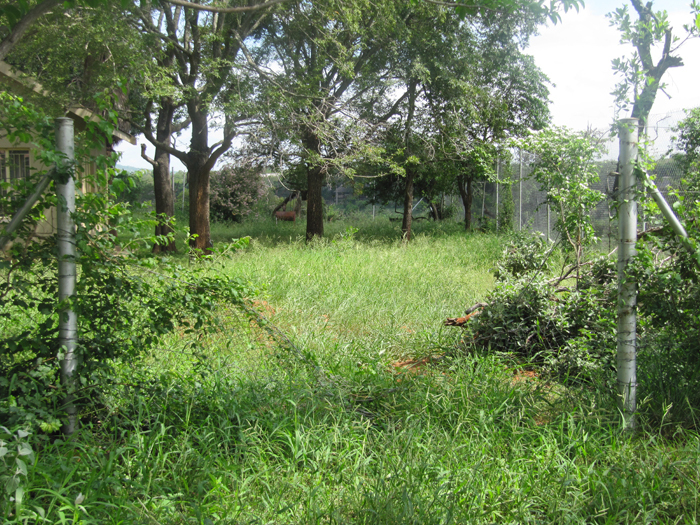 And Kruger, our beloved back yard, was looking so lush and green! The Crocodile River had picked up and was flowing beautifully; the grass had grown tall in the time we were away! A lot happened in our Kruger garden during our absence. For starters, our rain gauge had 55 mm in it! Which explains the green abundance all around. Not just in the park itself, but in our garden too! The wild grass and paper thorns sprouted all over and grew to about knee length in the two weeks we were away! It is going to be a massive job to get rid of all that before we can start to plant grass. Luckily we found a good gardener to help us with that! My veggie patch is a big mess… All my onions are gone, so is most of the spinach and the cauliflower. The paprika plants took a bit of a knock when the potato plants fell on them, but luckily most of those are intact. I pulled the potato plants out and actually got a small harvest of baby potatoes as a consolation prize! From what our neighbor’s son tells us a small breeding herd broke through the fence between our two gardens. By the looks of it, they went to town feasting on the veggies and succulents I so carefully planted and nurtured. I am convinced the elephants that we see around the house often just knew we were away! And they took full advantage of that knowledge. Anyway, onwards and upwards from here I guess. Let’s get the fence fixed (again) and continue with the garden and the veggies. A dear friend gave me a whole array of seeds I am going to plant soon and we will go from there. And tonight, we will have potatoes for dinner; Potatoes from our own Kruger garden. Harvested from the red soil I mixed with elephant dung as fertilizer. Thát to me is freaking cool!! Sorry to hear about your garden,but I do like you blog,any idea how you got on in the voting,I voted for you. Thanks for your vote, Lez! Glad you are enjoying my blog! The results will be announced on the 1st of February. Holding thumbs! Welcome back Linda; glad you had such a good time. But – oh dear! Your poor garden. The ellies certainly know how to be selective – only the best for them! I guess there were a few ellies out there wandering around with onion-breath for a couple of days 🙂 The potatoes look pretty good, I hope you enjoyed them, there is nothing like eating stuff fresh from the garden . . . . Good luck with the new planting. Hi Sal! The potatoes were a bit odd-looking. Some large and some very small. Makes me wonder how the ones we buy in the supermarket all get to be roughly the same size. Do they throw the rest away?? Haha, ellies with onion breath! Imagine that! And now our marula trees are carrying fruit… lol! I don’t think they throw the rest away, they grade them – so your lot would be Çlass 1 potatoes in a pocket, and the little ones would be New potatoes in a fancy little plastic pop pack with a pat of herbed butter in it!!! Oh, Marula jelly!!! I have no idea how to do that, but t sounds delicious and fun to do! Pretty simple I think. My sister used to make it. Thanks so much, Sal! I am soooo doing this!! Awh. Sorry. I hope your potatoes were delicious!! Thank so much, Linda! Haha never a dull moment in the bush, that’s for sure! The potatoes were delicious! Glad you enjoyed your family time in Holland. Happy you are back in Kruger. Have to wonder if the ellies were responding to the ellie dung you used in your plantings….. ha ha. Nice new potatoes. Reminds of my grandson who plants every seed etc he finds. His mom got red peppers and I got some new potatoes in my flower pot. He was so proud. Look forward to hearing about the kiddies school experience and your wonderful ongoing adventures. Hi Brigitha! Your grandson is really on to something. It is a great sense of achievement to watch something grow from a tiny seed into something you can actually eat! The elephants left me some fertilizer for my next crop. But it is marula season now and we have three fruit-carrying trees in our garden. Maybe not the best time to start planting… lol!